Collectibles of the Game is proud to offer this Official Major League baseball autographed by the #1 Draft Pick in this year's Major League Draft, Luke Hochevar. Hochevar guided the University of Tennessee to the College World Series in 2005, and earned the Roger Clemens Award that same year. The award, which is given to the nation's top college pitcher, was presented to Luke by Roger Clemens himself. Luke was taken with the 40th pick in 2005 by the Dodgers. Unable to reach a contract agreement with L.A., he waited a year and was drafted first overall by the Kansas City Royals. With a fastball that clocks between 93-97 MPH, the young Royals could use Hochevar in the big leagues sooner than later. 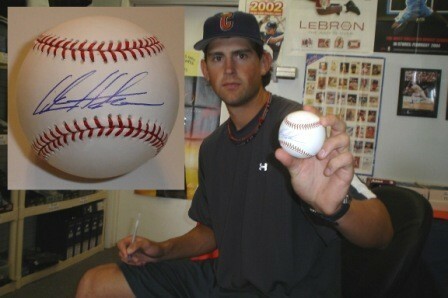 Luke signed this baseball during his first private signing on June 14, 2006 at Collectibles of the Game. The baseball features a tamper-proof hologram from Collectibles of the Game as well as a Certificate of Authenticity.